Belief can be misleading. It can start and end in the head. It doesn’t make for a sustaining meal. So why feed people doctrine when God has provided the eucharist? Why fantasise about God when you can actually taste God? And what is the flavour of God? God tastes like mercy. That is why the eucharist can change and heal deep, deep, right into our very cells, because it is mercy. It is mercy in edible form. Jesus said that to look at him is to look at the Father. See how the Father provides! If ever I lose all cognitive function, if I should be blind and deaf and dumb and paralysed from the eyebrows down, if I should be so badly burnt that only one patch of skin remains, then please, please, let me remember Jesus through the eucharist. Let me take it through a tube if I have to. Even just the touch of a consecrated piece of bread on that single patch of skin would be enough to put me at His table and be nourished by the feast of Heaven. Allelulia! Bread and wine: symbol, or flesh and blood? The answer lies not in doctrine but in the experience. Once consecrated the bread and wine carry a life force as potent as that of a mustard seed. Once consumed, once the seed has ‘died’ in our bodies, then we can feed on the resurrection life. Symbol, or flesh and blood? The answer is, both. The question is not if transubstantiation occurs, but when. 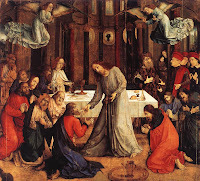 Why is it that we can observe such a physical change in people when they participate in the eucharist? It is certainly not because they have feasted on flesh and blood like cannibals and vampires! It is because the body and blood of Jesus represent pure alignment with the will of God. When we eat the consecrated wafer and drink the consecrated wine we experience--even if only for a minute or two--oneness between our will and God's will. Our will and God's will are one, just as God's will and Jesus' will are one. It is a state not only of grace but of yieldedness; it is grace-through-yieldedness.